Fresh off the plane, you’ve made it past the unexpected torrent of Indonesian men engulfing you in an echo of “Taxi? Taxi?” coming from every angle. You’re ready for a detox of mind, body, spirit and soul. In the cab (you shouldn’t have to spend more than 300,000 Rupiah), scooters zip through the traffic of the city and you’re off on your adventure. Be ready for anything, because surely this is what Bali will offer you. 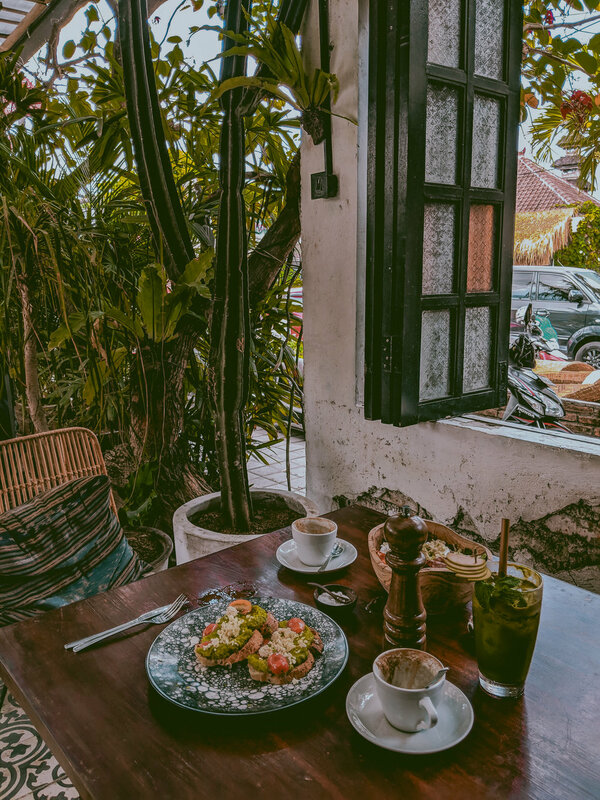 I recommend starting in Ubud, as it’s farther from the airport, which means your next stop will reduce the stress of Balinese traffic which can easily make a half hour drive into two hours. Puji Hostel will set you up in a bungalow that overlooks a rice field, perfect for slowing down as you lounge by the pool. They can also help arrange a sunrise hike up to Mount Batur right from the lobby with breakfast included. This is easily a highlight for many in Ubud, watching the neon red sun break through the clouds above the volcano. 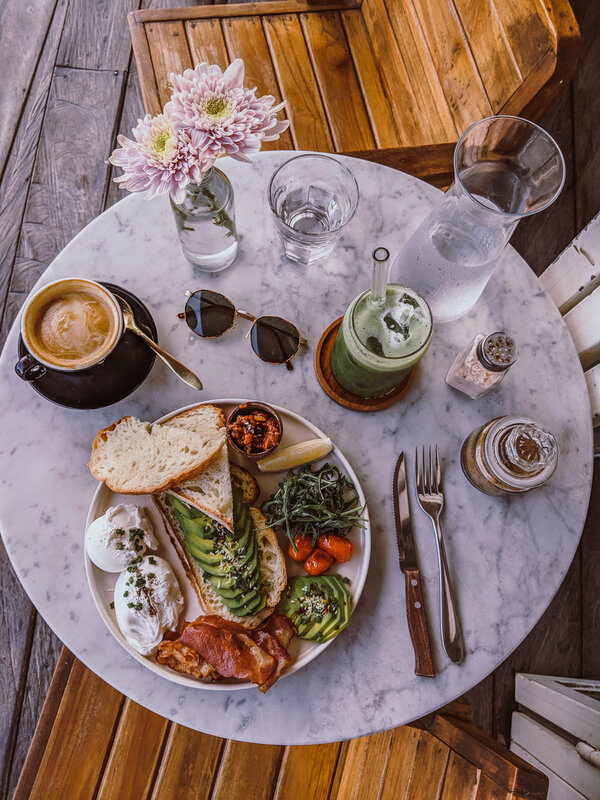 Bali is going to be on the less expensive side for travel and accommodation compared to the rest of the world in general, so if you’re flexible to spend a bit of extra money, look no further than Calma Ubud. The spacious, bright and calming rooms with canopied beds are an absolute luxury. Take the stone paved path down to the pool which overlooks dream-like greenery, with palm trees as far as the eye can see beyond an infinity pool. Treat yourself to a spa treatment in an open air bed and bath listening to the trickle of water passing below while the birds tweet and caw. I got a full Balinese massage, a milk scrub and a massive flower bath which took a good two hours, all for a whopping 27 USD. You freaking bet you read that right. You can’t very well go to Bali and not take a yoga class. Check out Yoga Barn or Radiantly Alive for a class that will clear your mind and loosen your body and soul. This activity comes with a warning so don’t do it because you think you need to do it, but: renting a scooter is the easiest way to get around. A friend and I tried to take a walk to breakfast and the heat of the early morning quickly caught up with us. The scooter allows you the freedom to get from point A to point B especially if it’s a touristy location to avoid the cab prices (and they will try and take advantage of foreigners). However, if you’re like me, you may think: “I was in South East Asia once already and never got a bike. I’m an adult! I can do this!” And then definitely crash it into a tree stump, get gyped into paying someone because you “crashed into his bike” and then try and reclaim yourself, try again, and drive into a poll - and then wake up with sore biceps because you were clenched so hard. My point is, don’t be a hero. If you’re comfortable, do it. If not, you can probably make a friend who can drive one. Bonus if they’re Balinese and trustworthy and can show you places you might not have had on your radar. 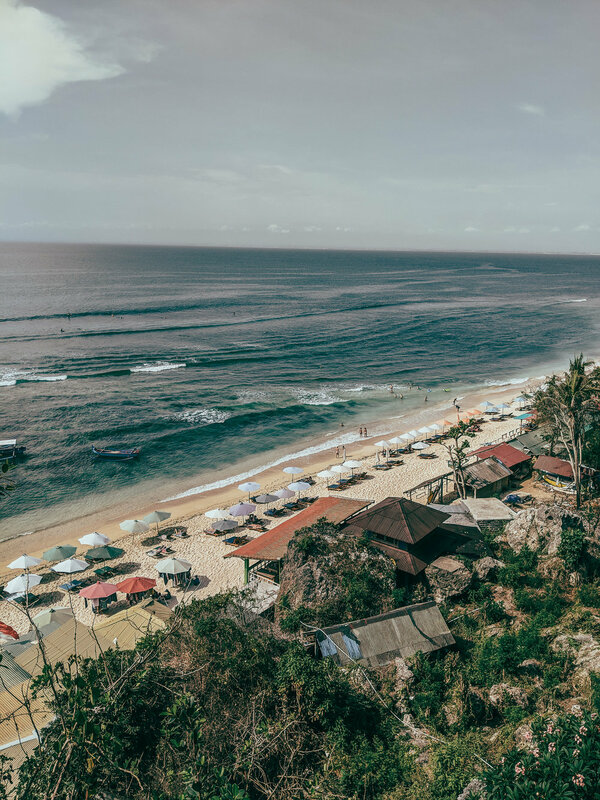 I won’t beat around the bush, Bali’s got some gems that make any follower full of envy and ready to book their own ticket. From Ubud, I booked a tour to my number one Bali bucket list location, Lumpanyang Temple or Gates of Heaven. With this tour, we got early access to the temple (be prepared for a line of tourists also trying to snag that shot) as well as the Mother Temples and The Royal Botanical and Water Gardens. Bali swings are a must-do. The Bali Swing will come up on your Google Maps, but try Tegallalang Rice Terraces instead and then take a walk around the rice paddies. These are what you came for, and they will be sure to blow you away. While you’re there, you can do a coffee and tea tasting. Definitely try the Kopi luwak coffee which is made from the poop of Asian palm civets. Honestly, it’s really good and worth a taste (cause the story). Truth be told, I suffered from a bit of Bali belly on this leg of the trip so as much as I wanted to try all the cafes and food around these areas, I just, no pun intended, couldn’t stomach them. I blame it a bit on this stew we were offered at a small bodega type convenience store that was being made by the lovely lady working there. While chewing on what we thought was potato, we soon realized, it might actually have been a piece of straight up fat. So, I’ll leave it up to your imagination but, as much as I want to be Anthony Bourdain, I should probably leave the food scouting to places that actually have a kitchen or a hot plate I can see. 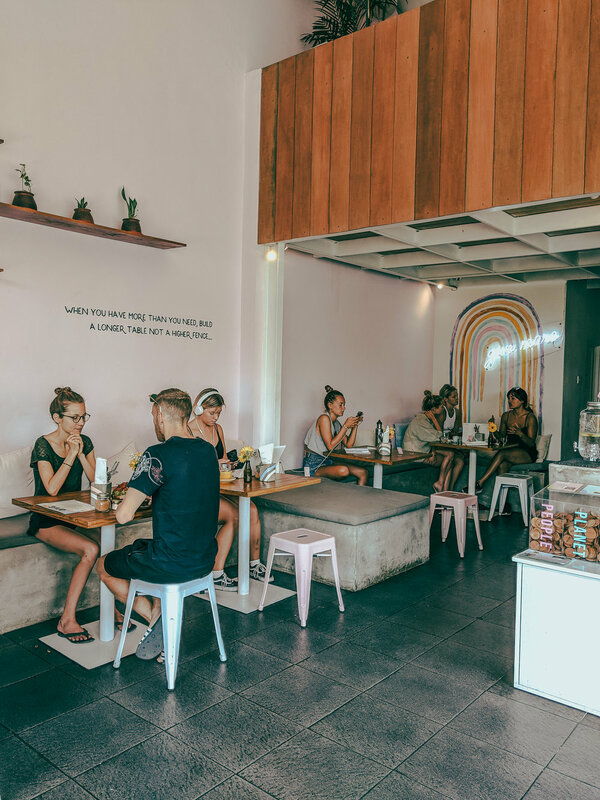 Canggu (pronounced: CHAngoo) aka: Where to head if you missed dat avo toast and are ready for some late night drinking and possibly a drunken tattoo on the beach. I was not expecting the culture here. I knew Bali had some killer brunch spots, beaches and rice fields, but Canggu hit me like a hurricane and I jumped in. If you came with your party pants on: Not going to sugar coat it, Lay Day Hostel messed me up. I met some of the friendliest open people who were game to start with a Bintang beer with breakfast and continued on until the sun rose again the next morning. With two pools and a 24 hour staff, a restaurant/cafe upstairs, you wouldn’t need to leave the property if you wanted to take it easy. A quick jet to the beach, this spot made it effortless to make friends and as a first stop for me, slide right into Bali life. If you came to ease in: Stay at The Barn. This place was recommended to me before arriving to Bali so it had been on my radar for a while. It’s a bit closer into the center of things, meaning it’s a bit farther from the beach, depending on your preference. Coming from Australia, the food prices blew me away. Breakfast, coffee AND a juice for 20 in a gorgeous atmosphere? Sign me UP! It’s hot and you can barely put away three meals per day, but that wasn’t going to stop me. After the sun goes down, check out Old Man’s, Beach Cafe or the Sand Bar. Honestly, my favorite thing about drinking down there is the corn on the cob you can get drunkenly from the stands, but the drinks flow and you can even get a tattoo down on the beach. You can easily get a scooter ride back to your hostel, but just have a head on you or head home with someone else staying with you. Take a trip to Uluwatu Temple for the Traditional Sunset Fire Dance - but be mindful of the monkeys. They are cute and unique but do not get close - they will grab your things, not give them back and will be vicious about it. Check out some of the beaches like Thomas Beach or Padang Padang Beach, most famous for its cameo in Eat, Pray, Love. Be warned, these beaches, while beautiful, are rocky and choppy, best for sunbathing. My time in Bali was outrageous, and will absolutely be a place I visit again.